BRAOU Eligibility Test 2019 for Admission into BA/BCom/BSc Degree Courses, Ambedkar University Open Degree admissions test 2019, Ambedkar University Distance Degree admissions test 2019, BRAOU Degree Course Entrance Test, UG Courses Eligibility test, BRAOU Degree Eligibility Test Online application form, Last date for apply for ET, ET Exam date, Eligibility Test Hall tickets, Eligibility Test Results and more details avialable at braou web portal: AP TS BRAOU Eligibility Test 2019 for BA/BCom/BSc Degree admissions 2019 and Online applications through braouonline.in are invited for appearing the entrance test for join in Distance ba/bcom/bsc degree courses at its Study Centers. We have a well-known saying "ILLALI CHADUVU INTIKI VELUGU" where a woman educates, she educates total her family members and also she educates her surroundings. Education says/learns everything that how speak? what to speak? how to tackle a terrible situation? It learns decision making, building of own character why because with out character every thing is zero that we achieved. To day if we see women's higher education is low when compared to men. Parents are responsible for this because they spend money for son's education where as they will not give much importance to daughter's education. This is due to illiterate parents. But, this situation is changing. Early marriages, Financial condition of a family effects their education. # అర్హత: ఇంటర్ ఉత్తీర్ణులైనవారికి నేరుగా ప్రవేశాలు కల్పిస్తారు. ఎటువంటి విద్యార్హత లేని 18 ఏండ్లు నిండిన అభ్యర్థులు ఎలిజిబిలిటీ టెస్ట్‌లో అర్హత సాధించాలి. # వయస్సు: 2019 జూలై 1 నాటకి 18 ఏండ్లు నిండి ఉండాలి. # ఈ ఎలిజిబిలిటీ టెస్ట్ ద్వారా మూడేండ్ల బీఏ/బీకాం, బీఎస్సీలో ప్రవేశం పొందవచ్చు. READ | How to enroll BRAOU Online Programs? Those who have zeal to study either men or women this is a golden opportunity to continue your education which was already discontinued. They can directly join in the degree courses by writing an eligibility test which was going to be conducted by the Dr. B.R. Ambedkar Open University. Dr.B.R.Ambedkar Open University has released the notification for degree admissions without any educational qualification but, the candidate should cross 18 years up to 1st July 2019. According to the notification an eligibility test will be conducted on below mentioned date at both Telangana and Andhra Pradesh states. In response to the overwhelming demand from the student community, the University has decided to conduct the Eligibility Test for the SECOND TIME in this academic year at the Regional Coordination Centers and limited Dr.BRAOU Study Centers only. Those who did not have qualification of intermediate or any equivalent qualification. Candidates should cross 18 years up to 01.07.2019. Above said candidates are eligible for applying eligible test to take admission in B.A/B.Com/B.Sc (3 years degree programmes) for the academic year 2019-18. So, Candidates who do not possess Intermediate (or) its Equivalent Qualification are eligible to appear for the Eligibility Test for seeking admission into I year of the B.A./B.Com/B.Sc (3 Year Degree Programmes) for the Academic Year 2019-2020, provided they have completed 18 years of age by 1st July 2019. Candidates who do not complete 18 years by 1st July 2019 are not eligible to appear for the Eligibility Test. Dr. B. R. Ambedkar Open University (BRAOU) will start “Online Registration” for Eligibility Test (E.T) - 2019 from January 11th onwards. 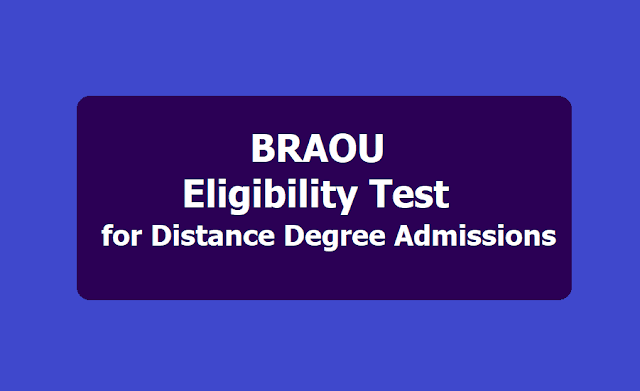 Candidates who do not possess Intermediate or its equivalent qualification are eligible to appear for the BRAOU Eligibility Test for seeking Admission into the First year Degree Programme for the Academic year 2019-2020, provided they attain the age of 18 years by 1st July 2019. The last date for Online Registration is April 18, 2019. The ET will be held on March 11 (Sunday) from 10:00 a.m to 12:30 p.m throughout the States of Telangana and Andhra Pradesh. The successful candidates will be given Admission into the first year U.G. programme (B.A/B.Com/B.Sc) for 2019 -19. How to apply for eligibility test? 1. Candidates wish to appear for ET shall register through ‘Online’ from our own website i.e., www.braouonline.in. So, Interested candidates can register their names from university portal www.braououline.in through online. 3. Candidates can contact study centre with recent passport size photographs and related documents (Certificates). 4. Through www.braou.ac.in candidates can give their required information through University website and fill your ET-2019 Registration form “Online” and upload photo and signature. 5. Pay Rs.300/- (Rupees Three Hundred Only) by debit/Credit Card through University online OR Rs.310/- (Rupees Three Hundred Ten Only) at the On-Line Franchisee Centre towards Registration Fee and obtain receipt. 6. Candidates should take their print out of registration form through university website and keep with you for your reference along with fee payment receipt. 7. The Candidate shall be allowed Tatkal Registration by collecting the fee of Rs.500/-. (b) See the University Website for the list of Study Centres, AP ONLine Franchise Centres, Information Brochure on ET-2019 and also Model ET Question Papers. c) The Sub Centres of the District Head Quarter (RCC) Examination centre will be merged to nearby the E.T. examination centre on any reasons. d) For further details, pl contact: 040 – 23680240 /246 / 254 / 241. MEDIUM & VENUE OF ET: This eligibility test will be conducted in Telugu, English and Urdu in all study centres of Telangana and A.P states. Test will be conducted in ENGLISH, TELUGU & URDU MEDIA at the Study Centres of Dr. B.R. Ambedkar Open University. READ |How to fill BRAOU UG Online Admission Registration Form? Candidates should not pay any fee at study centres they have to pay only above said centres. If the candidate of 2011,12,13,14 and 2016 is already passed the eligibility test and did not take admission may not attend the E.T again. Candidates those who have qualification of intermediate or any equivalent Qualification can apply when the notification releases on May/June 2019 for direct admission for I year U.G programme. 1.To Appear for Eligibility test -2019 [Eligibility Test-2019 For Admission into UG Programmes(B.A/B.Com/B.Sc. )], the candidates shall register ‘On-line’ through www.braouonline.in. 2. For that, application contact the nearby Dr.BRAOU Study center in your area for further information and to fill particulars through online. 3. Read the information given in the information Brochure completely before registration. 4. Pay the Registration fee Rs 300/-(Three hundred only) towards registration using Credit /Debit card OR Rs 310/- (three hundred and Ten only) through Online Franchisee centre. 5. Provide your mobile number or mobile number of your relatives / friends. If you do not have mobile phone compulsorily to enable the University to send SMS to you on various activities Please do not change your mobile number till the completion of the course. 6. Model ET Question paper is given in the Information Brochure for reference. Go through it carefully. 7. Instructions to fill the OMR Answer Sheet are also given inside to make you comfortable in the Examination Hall. a) The candidates are requested not to make any cash payment at Dr.BRAOU Study Centres. a) The Registration Fee need to be paid through debit /credit card or any A.P.On-line Franchisee Centres only: & (b) The candidates who have already passed the Eligibility Test conducted by the University in 2013, 2014, 2015, 2016, 2017 and couldn’t take admission into the U.G. Programmes so far, need not appear for the Eligibility Test -2019. They can seek admission into 1st Year U.G. when Notification is given for Direct Admission in May/June 2019 for candidates who possess Intermediate or its Equivalent Qualifications..
b) Visit the University Website for the complete list of Study Centres, Information Brochure ET-2019 and also the Model Question Papers.